Jump Into a Book has been lucky enough to participate in the Read Around the World Summer Reading from Multicultural Kid Blogs for the last handful of years. Read around the world this summer with great books recommended by the bloggers of Multicultural Kid Blogs (and friends like JIAB!) Throughout the summer this group of book-loving moms shares great diverse books that will interest the entire family. Mondays are for ages 5 and under, Wednesdays for children ages 6-10, and Fridays for tweens, teens, and adults. All posts will be shared on the Read Around the World Summer Reading Pinterest board(shown below), so be sure to follow. You can also join the discussion on their Facebook page and G+ community. The House That Lou Built: Lou has a dream—she is going to build a tiny house on the land she inherited from her father when he passed away. Lou’s land is the connection to her dad that she never had in real life. She knows her dad would have loved her tiny house plan. But when Lou’s mom announces that she’s considering a job in a faraway state, Lou’s dream is in jeopardy. Lou rallies her friends, her teachers, and her extended Filipino family to fast-track the tiny house and convince her mother they should stay put. When I first laid eyes on, The Secret of the Stairs, I was transported back to my love of Nancy Drew Mysteries. Action-packed and full of twists and turns, this delightful diverse chapter book will keep young readers mesmerized from beginning to end! Robbie Raines is an inquisitive eleven-year-old African-American girl with a deep love of history and the strange ability to see visions populated by famous figures. When she’s forced to spend her summer days with her mysterious Aunt Enna in a dilapidated, horror-movie-scary old house, she discovers a dark family secret. A local handyman was found dead in the basement years ago, and his death was never solved. Was it an accident? Or did her aunt commit a cold-blooded murder? The Girl Who Loved Wild Horses is a book by Paul Goble, and it is about a Native American girl who starts off by caring for her tribe’s horses and eventually becomes one with them. Read the full review HERE. Agua, Agüita/ Water, Little Water is a Spanish-English bilingual book is filled with gorgeous illustrations that perfectly complement the poetic tribute to the life-giving force of water. Tracing its origins deep within the earth, the book follows water through its entire life cycle, celebrating its dynamism and the interconnectedness of the natural world. Read full review HERE. In Time Tracers-The Stolen Summers time disappears and 3 teens find themselves facing the first day of school when it just ended the day before. Only the mysterious man in the grey suit can help Taj and his friends solve this conundrum. 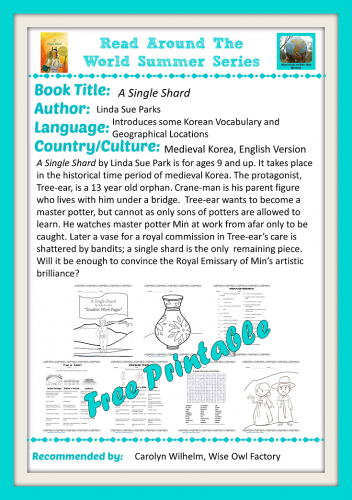 A Single Shard by Linda Sue Park is book for ages 9 and up and set in medieval Korea. Read the full review, plus access some free printables, HERE. Discover even more diverse YA, Picture Books and even adult picks on the Read Around the World Summer Reading Pinterest board(shown below), so be sure to follow. You can also join the discussion on their Facebook page and G+ community. COMING SOON! The much-anticipated sequel to JIAB intern, Hannah Rials’ runaway YA hit, Ascension. Book Two in the Ascension series is Clandestine and its already bringing in raves reviews.